Happy New Year! I hope everyone had a quality holiday break. 2019 is now upon us but before we can crack into a fresh 12 months of the search for the perfect parma lets first get a bit retrospective and take a look back at the year that was 2018. 2018 was a quality year! We had parmas in cast iron skillets at GG EZ, we discovered the unholy abomination that was the Cheeseburparma at Father’s Office, we launched the first of a couple of video reviews with The Barwon Heads Pub we had a parma on the other side of the flippin’ planet in Galway, Ireland and even got a mention in both the Herald Sun and the Wall Street goddamn Journal! Looking back on 2018 I’m surprised at how many decent parmas we found. Compared to 2017 (which I have since dubbed “The year of the stinkers”) the bad to good parma ratio definitely leans towards the good end of the spectrum. It was early in 2018 that we discovered the parma at the Workers Club in Fitzroy, and for quite a while it was the hot favourite to take home the Best new parma of 2018 award (like I said, competition this year was fierce). Not only was the schnitzel massive, engulfing everything on the plate, the chicken was of the purest quality, the toppings were fantastic and the sides brought it all together. It’s not often a big parma like this ticks so many boxes in other areas, but the parma at the Workers club managed to pull it off. Any other year this parma would have taken home a trophy, so I had to give it an honourable mention here at the very least. Check it out. A parma, sliced like a pizza that you can eat with your hands? Sign me up! We didn’t get to many home delivered parmas this year, mostly because I’m running out of restaurants in my area that actually do parma delivery. Luckily of the two home delivered parmas we tried in 2018, the one from Frank’s Ristorante was pretty damn good! Bad boy chips, super thick schnitzel, slathered in toppings. Pretty much the best parma in the Essendon area you can enjoy without putting on pants! This one is gonna be a tad controversial, I’ll explain why in a moment. However. Almost instantly after the review went live I started hearing reports that the parma Hardimans is now serving is no longer the parmesan and prosciutto encrusted glory that you see above. It has been scaled back to a more traditional parma. Not bad, but definitely not as unique and special as the parma we reviewed. Will be doing further investigation on this one in 2019 so stay tuned. Hopefully before we get back for a re-review the Hardimans parma can be restored to what we reviewed, as it was truly something special. To be perfectly honest I’ve just made up this category so I can give The Cheeky Pint in Footscray a mention. As I said competition for the top spot was fierce this year, we had so many good parmas but it wouldn’t feel right not even giving them a nod. Alright! Now for the trophies. For newcomers the Best New Parma is the first of two awards we give out every year. Simply put the Best New Parma award goes to the best parma we ate in 2018. The highest scoring new addition to the list in the last 12 months, and this years winner shone high above all the fantastic parmas I have just listed - Congratulations to Abbotsford’s The Park Hotel. We’d tried it before in 2012 and, even though it was good back then, the new and improved Park Hotel parma is next level. Thick, plump chicken breast and lashings of smoked ham bring this flavour sensation to life, accompanied by perfectly seasoned chips and a tantalisingly fresh coleslaw that sides the parma perfectly. If you have yet to visit the Park (or their sister pub, The Royston in Richmond) I highly recommend you do. You won’t be disappointed. While the Best New Parma goes to the best parma we had of 2018, Parma of the Year goes to the best parma we've had since ParmaDaze.com started in 2010 - and as none of the parmas we had in 2018 have topped the 2016 and 2017 winner a third trophy was delivered to Melbourne’s parma kings… The Birmingham Hotel in Fitzroy. Still fantastic after all these years, and consistently packing in the punters on their Tuesday & Wednesday $13 parma nights, not only is it the best parma in town its also the best parma night in town. A well deserved hat trick to The Birmy. And with that another year is over! Massive thanks to all the readers for the support throughout the year, your comments, suggestions and abusive emails are what keep me going. Another big thanks to the review team, When you drunkenly agreed to do a weekly parma with me after a filling meal and too many pints at Mrs. Parmas I bet you didn't think we'd still be doing it 8 goddamn years later. Couldn't do it without you all. Many, many thanks. I hope you enjoyed our retrospective on 2018! I hope I didn’t miss any. Naughtons and The Last Jar were pretty great too. New reviews kicking off next week. Stay tuned for a heap more fun in 2019! Well December is upon us again, which means its time to look back on the year of parmas that was, point out some highlights and at the end we'll award some golden chook trophies to the best of the best. Sound good? Good. 2017 was definitely an interesting year. It was the year of our 300th review, the year of the Parma Pie, The year of the Larmagiana, and (at quite a low point in the history of the website) the year I ate parma flavoured dog biscuits. Being the first of the year, we didn't even have a chance to warm up beforehand. "Just a casual parma at an American themed diner" we thought, "nice easy way to start the year" - But Americans do things big. While it didn't blow us out of the water with its flavour, if you want a challenge then Bobo's is definitely one to check out. If you don't care too much about quality and just want a feed to soak up some beers, then it's almost impossible to look past the parma at Forester's. Five bucks. With chips and salad. Every day. Do I need to say any more? It's not going to win awards but it wasn't offensive in any way, shape or form - And to be honest we had worse parmas this year that we paid over 5 times the price for. I'm still amazed at how well this worked. After the first few bites you could forget you were eating a novelty parma and just enjoy it for what it was - A huge, pristine schnitzel with a tasty bolognese, delicious ham and perfectly melted cheese - the pasta sheets and white sauce were just a bonus. Congrats to the Duke and congrats to competition winner Gabby for coming up with the winning recipe and scoring a year's supply of free parmas! Partly because there are so many take away parmas in Melbourne that were going sorely ignored, and partly because I'm getting lazy in my old age and have begun counting any time I can avoid putting on pants as a win -But 2017 saw the introduction of a new category of review at ParmaDaze - "Crossing the Road", a category dedicated to home delivered parmas. While a few of them were pretty mediocre - One stood out by far as the best we've had in 2017. Toto's Pizza House. I could sit down at a pub and receive this exact parma and wouldn't bat an eyelid. Restaurant quality delivered to my door - Very impressed. Saint Kilda's The Fifth Province absolutely smashed it in the self improvement category this year. Every criticism we had of their parma in our 2015 review was addressed, and they improved in areas we didn't even think about. A great improvement, a great pub and a great parma. Alright! Now we're getting to the pointy end. For newcomers the Best New Parma is the first of two awards we give out every year. Simply put the Best New Parma award goes to the best parma we ate in 2017. The highest scoring new addition to the list in the last 12 months - and while this year's winner is a bit of a surprise, I proudly award Best New Parma 2017 to The Wandi Pub in Wandiligong, Victoria. It's about a 3 hour drive up to Wandiligong from Melbourne. A 6 hour round trip if you don't want to stay the night (although there is on site accommodation if you do). Even so I'd say its definitely worth the trip. Look at that beast. Doesn't it make you hungry just looking at it? Even the experience of the Birmy has improved a little since last year - The tap list has gotten a fair bit craftier with a bunch of new breweries getting space (Cavalier, Goose, 4 Pines, Sample to name a few). I'd even say the chips have gotten slightly better as well. They seemed a little less oily this time around. Congratulations again to the Birmingham. An award well earned. Also big thanks to the review team, When you drunkenly agreed to do a weekly parma with me after a filling meal at Mrs. Parmas I bet you didn't think we'd still be doing it 7 goddamn years later. Couldn't do it without you guys. Many thanks. Have an awesome holiday season, I'll most likely be posting of my exploits on Instagram more than anywhere else so that's probably worth following if you aren't already. Should be back in action mid-January 2018 ... Catch you then! (No dog biscuits next year... I promise). Well its December. The month where families gather to spend time with their loved ones, exchange heartfelt gifts, and read about which chicken parmigiana we thought was the best. It has been an interesting year for ParmaDaze, We enjoyed a parma in an American style diner, a parma designed by a MasterChef Champion, a Curry parma in a Japanese restaurant, a few parmas and some other heart-attack inducing grub on a road trip through the Southern United States, sampled every parma we could get our hands on during a week in Byron Bay and went yet another year without recording a new episode of our podcast. Coleslaw seemed to be the big addition to parmas in 2016, it seemed like every second parma we had was sided with a serve of 'slaw as opposed to the traditional salad. I'm not complaining, a good slaw can really drive a parma home, but it is interesting to note that the trend seems to be swinging that way. Seeing chip after chip every week its rare that we come across a form of fried potato beside a parma that makes me stop and think "damn, thats unique", and while not technically chips they definitely got our attention. Crisp and crunchy on the outside opening up to fluffy clouds of potato inside. Fantastic flavour that barely needed seasoning – I could have easily downed a full plate of these solo. A very welcome change from the norm and something I'd like to see a lot more of in the future. How we choose a location for our parma reviews every week depends on a lot of factors. Sometimes its a parma we've just heard about that does something unique or interesting, sometimes its a parma we've been recommended by readers, sometimes its a decent looking parma I spied on Instagram, and sometimes your wife is on late shift so you can't be bothered going far from home - You can normally spot these ones, they're the ones at pokies pubs or cafes, usually around Essendon or Moonee Ponds simply because we don't have time to travel far on a Thursday night - Hopes are never very high for these ones, which is why, when we found the parma at Crème, I was stunned. I had written off the Crème parma as crap before we walked in the door, imagine my surprise when this sizeable and flavoursome bird fell in front of me. This isn't right! Crème is a cafe, not a pub! None the less they turned out an extremely enjoyable parma that I am thrilled to know is nearby when I need it. We had quite a few redo's this year, more than any year previous, and in that bunch of revisited pubs I was surprised at how many of them actually managed to pull up their socks and improve their product. Picking a winner for most improved parma is tough as there were so many good ones. In fact, I'm gonna need to call this one a tie, between The Rose Hotel in Fitzroy and Richmond's Royston Hotel. The Rose Hotel underwent an amazing transformation. Both the parma and the pub itself are virtually unrecognisable. When we originally had it in 2010 it was absolutely horrible with zero redeeming qualities (other than the breadstick, which was a nice addition). In 2016 it was a damn fine bird. Quality chicken breast, tasty toppings, an all round hearty meal. The Royston wasn't that bad to begin with, but they turned it into something phenomenal. If you throw out the scores for Chips, Salad and Value the Royston's parma is our second highest rated of all time, behind this year's Parma of the Year Winner. Both well deserving of the title of most improved parma. Billy walks around the Palace likes he owns the place, and rightfully so, his face is literally on the walls in the beer garden and on the logo for the pub itself. Oh, and the parma isn't half bad either. Who would have thought when we walked into our first review of 2016 that we would be walking in to a new #1 parma for ParmaDaze. It's no secret so lets no bury the lead, Parma of the Year for 2016 goes to the outstanding Birmingham Hotel. Its always controversial when a new leader is crowned, but I stand by it ... The above photo was taken last weekend when we presented the Birmy with their award and the parma is as tasty as it was in January. If you haven't yet you can read our original write-up here. Absolutely outstanding. Congratulations to the Birmingham. An award well earned. And with that another year is over! Massive thanks to all the readers for the support throughout the year, your comments, suggestions and abusive emails are what keep me going - Especially those who have already signed up to our 2017 Parma Knight's membership program, you guys are the real MVP's (memberships still available here ... Would make an awesome Christmas gift for the parma lover in your family ... Just sayin'). Also big thanks to the review team, When you drunkenly agreed to do a weekly parma with me after a filling meal at Mrs. Parmas I bet you didn't think we'd still be doing it 6 years later. Couldn't do it without you guys. Many thanks (although you need to get off your collective asses and come record another podcast with me). Should be back in action mid-January 2017 ... Catch you then! Hold on! Don't finish the year just yet! We've got some Golden Chooks to hand out. Well that was 2015! Quite a milestone packed year that rung in both our 5 year anniversary and 250th parma review! It was quite the year for the non-traditional parma, with a BBQ Bacon parma that blew our socks off, a curry sauce parma that was so packed with flavour it still invades my dreams, and a bunch of shredded-ham delights in my favourite beer garden in the state. We ate a hell of a lot of chook in 2015, and also witnessed more getting eaten in one sitting than any mere mortal should deem possible. All up it was a stellar year with some phenomenal birds ... Now it's time to give them the trophies. Now we give out two awards each year, Best New Parma, is awarded to the best parma we have had in the 2015 season, and Parma of the Year, which is awarded to the pub who sits at #1 on our ladder. Both are extremely rare and prestigious awards, the Oscars better watch their backs as we have our sights set to overtake them in popularity very soon. If you're too lazy to check the full review, below is the pic of the parma the first time we had it, note the unique salad/coleslaw hybrid, which Reviewer Stefo dubbed "sal-slaw, a fanstastic addition to the dish. Congratulations again to the Aviary! Is it even worth hyping it up any more? You know what its gonna be. Taking out the Golden Chook for the Fourth consecutive year, the Imperial Hotel is still second to none. 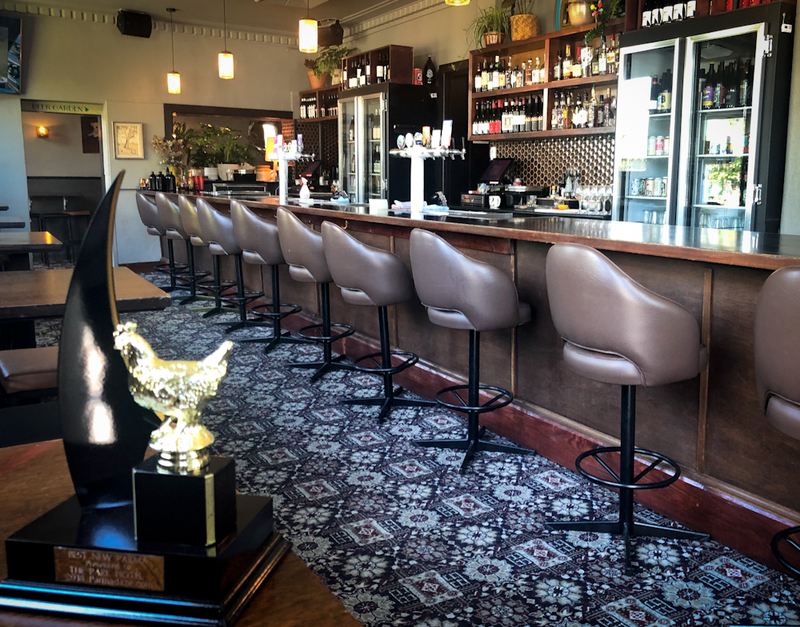 As a celebration of the end of 2015 we arrived at the Impy on Sunday to present them with their trophy, as well as get our fix of the best parma Melbourne has to offer (in our opinion, anyway). A stunning new rooftop bar has been built at the tippy top! Unfortunately we picked the one day of the last week where the skies opened up with rain, so after appreciating the sights we headed back down and got down to the important business ... the parmas. I was a little concerned when the parmas first fell ... Has it shrunk?! Luckily not, it was just not hammered down enough. Shortly after tucking in everyone at the table was sitting back emitting groans of contentment - This parma is still a beast, still delicious, still number 1. Notice the sign above the fridge? Love it ... although its gonna need an update! And with that, 2015 is done. Be sure to stay tuned for 2016! I'm looking at my "list of parmas" taped to the wall of my office and there are quite a few that I'm very excited about. We've got some other things in the works that I can't announce just yet, but rest assured they're going to be all sorts of awesome. Oh, and I promise we'll get another podcast out in 2016. Congratulations again to the winners, a massive thank you to all you readers, especially those who follow my shenanigans on all the social medias (facebook, twitter, instagram), and a huge thanks to the Review Team ... Who I doubt will actually read this, but my gratitude is with them none the less. Hope you all have a great holiday, and awesome New Year, and we will catch you in January! So that was 2014! In twelve short months we celebrated our 200th parma, saw an unholy abomination come out of Red Rooster, we experimented in the kitchen with a Philadelphia cream cheese parma, chicken parma balls and a bacon and tater tot creation. 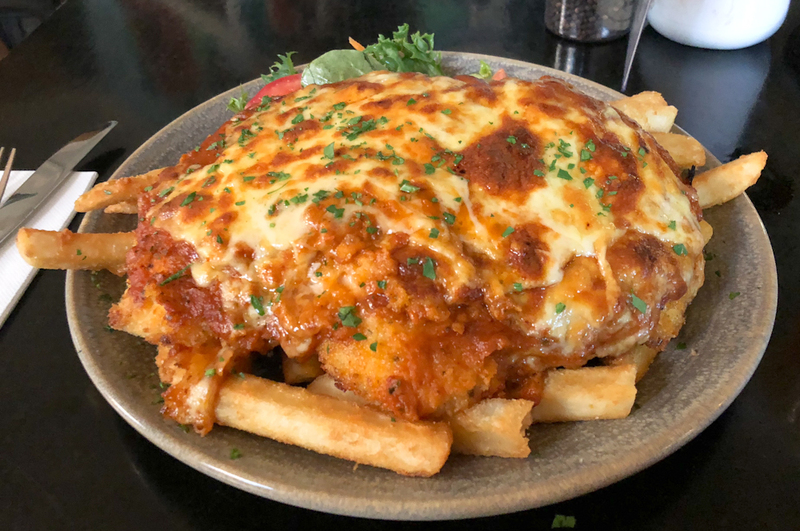 We ate 5 parmas in a week in Hobart, checked out two parma offerings Port Douglas had to offer, started the Chicken Parma Subreddit and launched a parma-centric podcast called Clucking Around! - couple all this with 42 regular reviews and it all adds up to a damn busy year for chicken parmas! And as always, we finish the year up with some awards. Now we give out two awards each year, Best New Parma, which is awarded to the best parma we have had in 2014, and Parma of the Year, which is awarded to the pub who sits at #1 on our ladder. Both are extremely rare and prestigious awards of nobel-prize like status! One thing I am proud of when it comes to our top 10 parmas is that, even though they are all fantastic, they aren't all cookie-cutter copies of each other. Almost every parma in our top ten is unique in its own special way - And the parma at the Wolf & I fits the bill to perfection. You can read the details of our original attempt here, so I won't go into too much detail, but the liberal lashings of smoked, shaved ham is what sets this parma apart from the others and puts it in the big leagues (not to mention everything else is phenomenal - the salad alone proves that you can have a basic, simple garden salad as a side and it still be damn delicious). Congratulations again to The Wolf & I! What is there to say that hasn't already been said? The Impy still offers up the closest example of parma perfection that we have come across. We didn't stick around try it this year after we presented them with their trophy, as we were quite stuffed from the parma at The Wolf & I, but we could see several hungry diners tucking in to the fine example of a parma that The Imperial has to offer. Massive schnitzel, cheese laden salad, chunky beer battered fries ... I mean look at it! Congratulations (again) to The Imperial Hotel! Very well deserved guys. And with that we are wrapped up for another year of parma reviews at ParmaDaze. It's been a hell of a year and we couldn't have done it without you guys - so if you're reading this, I thank you. We may be taking a break - but don't despair, We will be back with a vengeance in 2015, with lots of exciting things on the boiler (including but not limited to our five year anniversary ... but more details on that later). So from all of us here at ParmaDaze, have a fantastic holiday season, congratulations again to The Wolf & I and The Imperial, and we'll catch you in the new year! Another year has passed in the search for the perfect parma, which means the time has come to hand out some golden chooks! We did things a little differently this year, rather than have just the one trophy we split the dazey up into two categories. Best New Parma and Parma of the Year. The "Best new parma" dazey is awarded to the best parma we have found in the last twelve months of parma reviews. We have consumed over 40 parmas since Taco Bill in January (not including special events) and this parma stands out amongst the rest as the best we tried in 2013. When we discovered The Duke back in May this year it was just a baby, having only been open for just over a month, but it managed to leave a lasting impression. Not only is The Duke an amazingly well fit out pub with a fantastic atmosphere, the food is absolutely phenomenal. The parma is amazing. Fresh, real chicken, gorgeous crispy crumbs, the list goes on ... 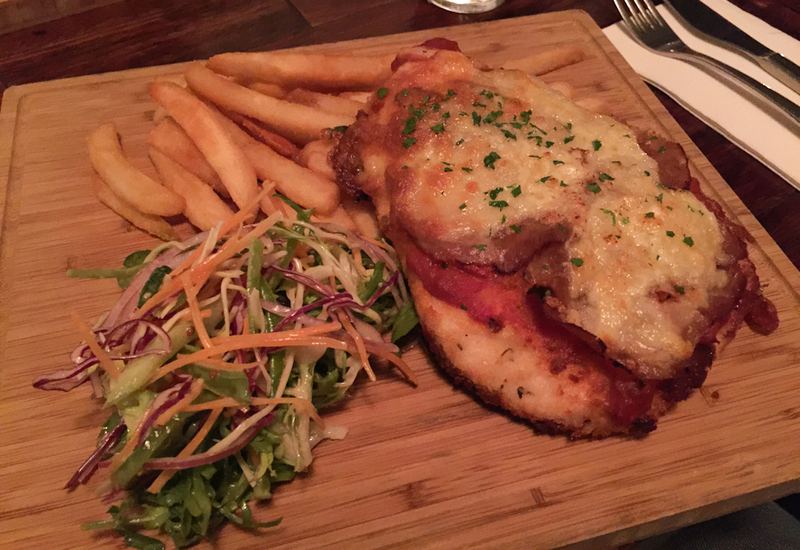 If you want to hear me gush about this parma some more check out the original review here. The garden salad is gone! replaced with a very hearty serve of coleslaw. The Salad at the Duke when we first reviewed it was it's biggest downfall, it wasn't bad at all, but it wasn't exciting - there's only so much you can do with a garden salad. The coleslaw, however, is definitely a change for the better. Oh, and if you happen to go temporarily insane at The Duke and decide you don't want a parma (madness), the other items on the menu are damn good too. I can recommend the mexican chicken burger in particular. If you can handle a bit of spice this is bloody good. So congratulations to The Duke. An amazing pub with terrific atmosphere and a parma that you'd be hard pressed to walk away from disappointed. Well done guys! What can I say about the Impy that hasn't already been said here, here or here! ... A bit, actually! Even though they took out our Parma of the Year in 2012 the Imperial has not rested on its laurels, striving to improve what was already the best parma we have had so far. We have a rule at Parma Daze that if a pub, once reviewed, works hard to improve what they have served us then they are eligible for a redo. After the effort that The Imperial has put in to improve their parma since we first tried it in August 2012 we figure its only fair that they are also eligible for a redo. So not only did we present The Impy with their parma of the year trophy, this post will also serve as the Redux for the Imperial Hotel (don't ask me why we call a redo a "redux" I got it from the Apocalypse Now directors cut and now it has become a thing). So what has changed? We ordered our parmas and awaited their arrival. Shoutout to the table of 20+ blokes there last night celebrating the last parma of their work's "Parma Club" for the year - You chose a great pub to finish things off! The parma itself remains pretty much the same. Mammoth hand crumbed schnitzel, lashings of ham, perfectly golden brown cheese, I've said this all before so if you want more detailed info on the parma check it out here and here. Now, here is where we get into the big changes, first up - the chips. The Impy's chips were never bad, but much like the old salad at the Duke there's only so much you can with regular steak fries... But they've had an upgrade. Beer battered chips! The king of chips, these beauties have a golden crunch and are perfectly seasoned. We were brought out some sauce pots to accompany the chips but to be honest they didn't need them, these chips were just fine without dipping. How could you make a garden salad infinitely tastier, while at the same time removing any redeeming nutritional value? By covering it with cheese of course! The Imperial salad is layered with a heap of freshly shaved parmesan cheese, which definitely takes it to another level. The Impy's parma isn't perfect (the salad could use a bit more dressing and the parma itself has, on occasion, been a little light on the napoli) but its damn close. Oh, Also worth mentioning, that (as it is December) the Imperial's "Christmas Parma" is on the menu for this month only, so if you head down in December you're going to have a decision to make. They're both fantastic, but in different ways. I've said it before, but we judge a parmas "value" score on the question "Would I be happy to come back to this pub and pay what I paid for this parma again". I'd be happy to pay what this parma costs, along with airfare to get to Melbourne from wherever I was in the world. Yes its pricey compared to other parmas, but you pay for quality and I'd have absolutely zero qualms shelling out another $25 for The Imperial's parma. Back to back champions! Well deserved guys. Congratulations. And that wraps it up for another year of Parma Daze parma reviews! We are taking a couple of weeks off and will be back in early January to kick things off again. There are still a lot more parmas out there (seriously. my "parmas to try" list is currently over 100 parmas long and growing daily) and we wont stop until we get to them all. Massive thanks to the review team, I put the words on the screen but I couldn't do it without the support of you guys. Not to mention a super-awesome-mega thanks to the readers! The fact that there are people out mad enough to follow my ramblings gets me up in the morning, so again, Thanks. And that about wraps it up for '13! Be sure to stay tuned, we've got a lot of awesome stuff on the boiler for next year, and their might even be a little non-review update on the site some time around the end of December, make sure you follow one of our social media things for a heads up. It wasn’t a big surprise, was it? The Imperial Hotel has been on the top of our Ladder since August and we revisited two weeks ago to give their amazing Turkey Parma a try. When it comes to the most outstanding parma of 2012, the Imperial definitely takes the cake. This post will be relatively short, as I’ve said everything that needs to be said about the Imperial Here and Here, but in short, if you’re a lover of a quality pub and a parma you would struggle to top, then you must pay the Imperial a visit. Now. The golden chook, or the “dazey” … which do you think has a better ring? The salad has had an upgrade! There are two ingredients in the world that make any dish better, the first one being bacon (duh) but who can tell me the second? If you answered “cheese” you’re right! The salad has had a complete redo, and the addition of shaved cheese on top really brings it to life. It’s not quite as healthy anymore, but if you’re eating the Imperial parma then I’m pretty sure you aren’t counting calories. Thanks to everyone for reading, and if you think you know of a pub that could challenge The Imperial’s crown be sure to let us know over on the facebook or twitter and we will check it out in the new year. Thanks to The Imperial Hotel for putting up with our nonsense, and from everyone here at Parma Daze I hope you all have an amazing christmas, an even better new years, and we will catch you all with some brand new parma news in January! Back in July we headed down to Port Melbourne for a Parma, To be honest I dont quite remember how we found the Exchange, but I’m damn glad we did, as the parma we found in that review (which you can read in full Here) was absolutely amazing, So when the time came to present the inaugural Parma of The Year for 2011 (or the ‘Dazey’ as we have dubbed it) the choice was clear. I’m not going to go into full details & scores about the parma this time around, as that was already covered in detail the first time we visited, This trip was more of a gathering to round out the year, Inform The Exchange of the good news and indulge in the best parma this side of the black stump. Last time around we only got tomato sauce, and that was more than enough for me - however The Exchange has outdone itself this time around, providing both tomato sauce and garlic aoli for chip dippage. perfection. Also served in a seperate bowl, its simple, elegant and classy. not much to say other than it complimented the meal perfectly - even the reviewers why usually avoid the greenery tucked in with gusto. After we finished our meals and reaffirmed our decision that The Exchange more than deserve the Dazey we asked if we could have a word with the Head Chef, Ryan Thompson, so we could present him with his award. During a brief chat with him he let us in on a little bit of parma trivia - He has also worked at both The Metropolitan Hotel (which held our Number 1 spot for a very long time) and the Albion Hotel (Where we attempted both the Double and Triple parma challenge) This man knows his way around a parma, and I can think of no man more deserving of the Parma of the Year. If you havent been yet - go now. The search continues… Although its damn tempting to stop here. Before I sign off a quick thankyou to all our readers who tune in every week to support our insane quest - we couldn’t do it without you guys. well, we could, but it wouldn’t be nearly as much fun. I hope you all had a fantastic Christmas and have an even better new years. The search is not over! we will be back sometime in January to continue the quest, with some pretty cool stuff planned for the new year. Catch you there!